need help please make a easy tutorial and a bit slow also :p new members cant understand soo plz make a tutorial to host bantool in windows plz ! You use latest RCM version? From this webpage To view links login or register for the conference.? Need download this To view links login or register for the conference. for windows. if u have time visit my fb and try to give solution personally plz ! LOL how to upload images ?? how to know localhost ip address ->To view links login or register for the conference. In line 5 and 6 add your server localhost ip adress, USE tutorial under message . how to know localhost ip address -> To view links login or register for the conference. In line 9 ($mplogfile) need add path to games_mp.log file, you can find this file in game server main folder! Important factor FOR $mplogfile line! 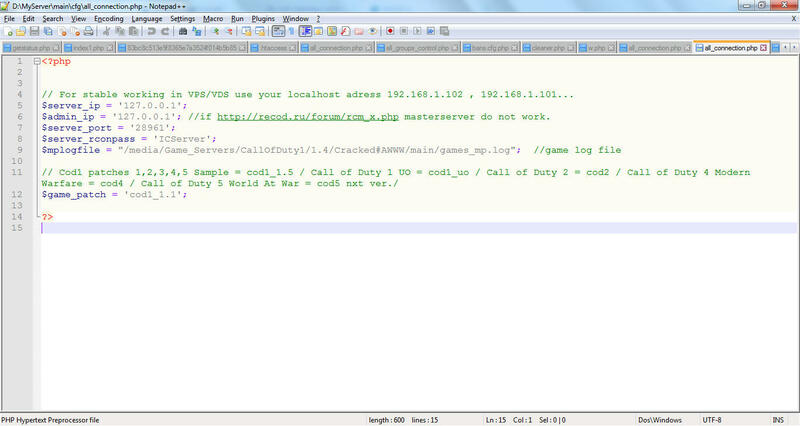 Example for windows with double slash: $mplogfile = "D:\\Myserver\\cod1\\cod1.1\\main\\games_mp.log"
That all. iF THIS 3 lines is corect, rcm can be working fine! In go file working time, cmd showing help message how install admintool. seta g_log "" (WHEN ITS EMPTY, BUT NEED MAKE seta g_log "games_mp.log"
Take a good look in end of readme To view links login or register for the conference. Admin commands don't work, or all commands do not work? IF DO NOT WORK ADMIN COMMANDS! 1.VARIANT CHANGE PASSWORD LINE 11 IN cfg/all_groups_control.php To view links login or register for the conference. FOR cod1 patch 1.1, this password not hided! 2.VARIANT CHANGE PASSWORD LINE 11 IN cfg/all_groups_control.php To view links login or register for the conference. IF DO NOT WORK ALL COMMANDS AND YOU USE COD1 1.1! Need only open eyes here To view links login or register for the conference. na no messages r showing ! can u come on team viewer ?? Yes its possible. Create in PM login for it.